Here is the message from the great director Robert Lepage for the World Puppetry Day that we will celebrate together on March, the 21st. We are happy that he accepted our request and we want to thank him deeply. We have received the text just before the earthquake in Chile. The English translation has been made by Penny Francis (England) and the Spanish one by Idoya Otegui (Spain). Once again, all the UNIMA members are offering their deepest sympathy to haitian and chilian people. “Like many people, I was profoundly affected by the earthquake which has recently devastated Haiti. Looking at the images constantly relayed on television and on the web I asked myself, among all the mediums of the performing arts, which would be the most effective for expressing the human dimension of such a cataclysm? Which medium would best evoke compassion without descending into mere pity, to inspire solidarity without being moralizing, and which would be best able to provoke in our own body an echo of the physical pain of the wounds and amputations? In fact, I asked myself how one could transpose onto a stage not only the grief of the Haitian people, but equally their resilience which both moves and inspires us at the same time? It seemed to me that the puppet would be the best medium to convey this tragedy. Its powerlessness, its vulnerability, but in equal measure the force of its purity and its innocence combine to create a link both intimate and unique with the spectator. Such solidarity probably arises from the major advantage it holds over the human theatre and the cinema: the actor plays a part, the puppet is always true. In contrast to the actor, the cruelties done to the puppet are not feigned and when its strings are cut, when it is beaten, ridiculed, humiliated, ill-treated or dismembered, it never complains. It is repaired, re-pasted and once again it is on its feet, as good as new. Versatile in every form of theatre craft, Robert Lepage creates and directs original productions that shake the dogma of classical stage direction to its foundations, especially through his use of new technologies. Along with Ex Machina, his production company, he presented several theatrical productions that gained him an international reputation such as The Seven Streams of the River Ota, The Dragons’ Trilogy, The Far Side of The Moon and The Andersen Project. His film work includes The Confesionnal, The Polygraph, Nô and a film adaptation of his play The Far Side of the Moon. directed KÀ, a permanent Cirque du Soleil show in Las Vegas, which premiered in February 2005. In 2008, for Quebec City’s 400th anniversary, Robert Lepage and Ex Machina created the largest architectural projection ever achieved: The Image MillTM. 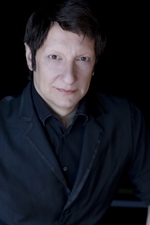 Robert Lepage’s work has been recognized by many awards. His last direction, The nightgale and other fables, involved opera singers, shadows and puppets.